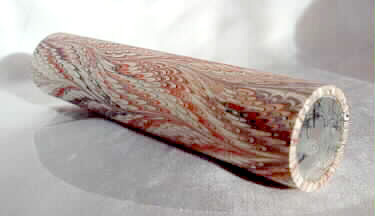 The kaleidoscope tube is covered with hand marbled paper. Let us choose one for you from the variety of papers in stock. 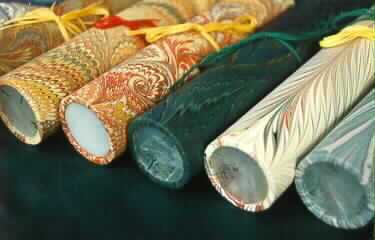 The exterior colors are reflected in the interior patterns. The scope itself includes a magnifying lens, which produces a full, focused image to enjoy. An optical quality 3-mirror system, and a free falling chamber filled with various bits and pieces means that there are no moving parts in my scope designs. 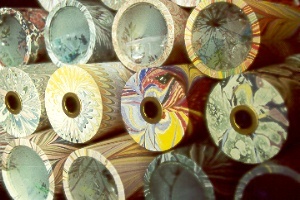 One simply rotates the whole tube to enjoy a changing pattern. This enables the mirror system inside to be as large as possible, to maximize what is viewed in the object chamber. These may include antique or new bugle beads, flameworking, millefiori, glass fragments, decorative beads, and twisted wire. There is no way to make two identical kaleidoscopes; each one is unique! Dimensions: 2" x 8 ½"
Price for HMP scope, including acrylic stand: $68. To order, print out an Order Form, and refer to this page for pricing details.